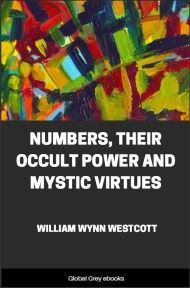 This is a review of number lore by William Wynn Westcott, an esoteric author of the 19th century. 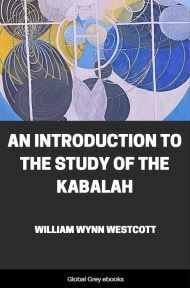 Westcott includes information on the Pythagoreans and the Kabbalah. 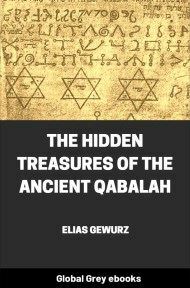 The main portion of this book includes a series of chapters dealing with every-larger numbers, starting with the 'monad,' 1. 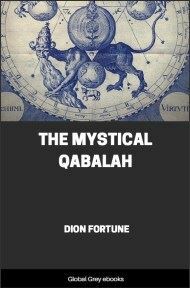 Westcott had a grasp a wide range of occult correspondences, and this short book includes many rare snippets of information. Pythagoras, one of the greatest philosophers of ancient Europe, was the son of Mnesarchus, an engraver. He was born about the year 580 B.C., either at Samos, an island in the Ægean Sea, or, as some say, at Sidon in Phoenicia. Very little is known of his early life, beyond the fact that he won prizes for feats of agility at the Olympic Games. Having attained manhood and feeling dissatisfied with the amount of knowledge to be gained at home, he left his native land and spent many years in travel, visiting in turn most of the great centres of Learning. History narrates that his pilgrimage in search of wisdom extended to Egypt, Hindostan, Persia, Crete and Palestine, and that he gathered from each country fresh stores of information, and succeeded in becoming well acquainted with the Esoteric Wisdom as well as with the popular exoteric knowledge of each. He returned with his mind well stored and his judgment matured, to his home, intending to open there a College of learning, but this he found to be impracticable owing to the opposition of its turbulent ruler Polycrates. Failing in this design, he migrated to Crotona, a noted city in Magna Græcia, which was a colony founded by Dorians on the South coast of Italy. It was here that this ever-famous Philosopher founded his College or Society of Students, which became known all over the civilized world as the central assembly of the learned of Europe; and here it was in secret conclave that Pythagoras taught that occult wisdom which he had gathered from the Gymnosophists and Brahmins of India, from the Hierophants of Egypt, the Oracle of Delphi, the Idæan cave, and from the Kabalah of the Hebrew Rabbis and Chaldean Magi. For nearly forty years he taught his pupils, and exhibited his wonderful powers; but an end was put to his institution, and he himself was forced to flee from the city, owing to a conspiracy and rebellion which arose on account of a quarrel between the people of Crotona and the inhabitants of Sybaris: he succeeded in reaching Metapontum, where he is said to have died about the year 500 B.C. B.C. 450.—Herodotus, who speaks of the mysteries of the Pythagoreans as similar to those of Orpheus. B.C. 394.—Archytas of Tarentum, who left a fragment upon Pythagorean Arithmetic. B.C. 370.—Philolaus. From three books of this author it is believed that Plato compiled his book Timæus; he was probably the first who committed to writing the doctrines of Pythagoras. B.C. 322.—Aristotle. Refer to his "Metaphysica," "Moralia Magna," and "Nicomachean Ethics." Nicomachus of Stagyra was his father. B.C. 276.—Eratosthenes, author of a work entitled "Kokkinon" or "Cribrum," a "Sieve to separate Prime from Composite Numbers." B.C. 40.—Cicero. Refer to his works "De Finibus" and "De natura Deorum." 50 A.D.—Nicomachus of Gerasa; Treatises on Arithmetic and Harmony. 300 A.D.—Porphyry of Tyre, a great philosopher, sometimes named in Syriac, Melekh or King, was the pupil of Longinus and Plotinus. 340 A.D.—Jamblicus wrote "De mysteriis," "De vita Pythagorica," "The Arithmetic of Nicomachus of Gerasa," and "The Theological Properties of Numbers." 450 A.D.—Proclus, in his commentary on the "Works and Days" of Hesiod, gives information concerning the Pythagorean views of numbers. 560 A.D.—Simplicius of Cilicia, a contemporary of Justinian. 850 A.D.—Photius of Constantinople has left a Bibliotheca of the ideas of the older philosophers. 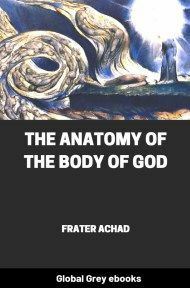 Coming down to more recent times, the following authors should be consulted:—Meursius, Johannes, 1620; Meibomius, Marcus, 1650; and Kircher, Athanasius, 1660. They collected and epitomized all that was extant of previous authors concerning the doctrines of the Pythagoreans. The first eminent follower of Pythagoras was Aristæus, who married Theano, the widow of his master: next followed Mnesarchus, the son of Pythagoras; and later Bulagoras, Tidas, and Diodorus the Aspendian. After the original school was dispersed, the chief instructors became Clinias and Philolaus at Heraclea; Theorides and Eurytus at Metapontum; and Archytas, the sage of Tarentum.